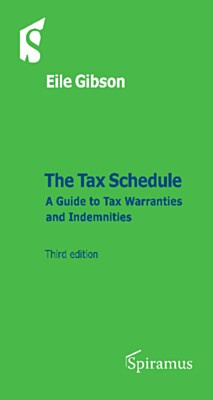 The Tax Schedule explains the underlying rationale of the key provisions of the tax schedule, and provides updated model long-form and short-form warranties and tax indemnities. These are also included on a disk, so that practitioners can download and adapt the model documents for their own transactions. Since January 2014 we have witnessed continued erosion of the powers of the tax evasion industry including a new Targeted Anti-Avoidance Rule (TAAR), increased penalties and new HMRC powers, major changes the taxation of UK property for non-UK residents and non-UK domiciles, and a recently introduced investors’ relief, similar to entrepreneurs’ relief but which is available to non-employees and directors. The book has been updated to reflect these developments. The purpose of the book is to explain and simplify issues for tax advisors involved in transactions of buying and selling companies and business, enabling negotiations between tax advisors to keep sight of the commercial reality of the transaction (a sale by a willing seller to a willing buyer). The purpose of the tax schedule is to determine where responsibilities and risks will lie following the completion of the transaction, as well as to re-examine a number of so-called ‘market practices’. This edition contains an extended glossary, details of new investor relief schemes and changes in legislation as announced as at 15 September 2016. 10.3 Short Form or Long Form Tax Schedule?